One of my favorite projects that I have worked on recently was save-the-date designs for Holly and her fiance, James for their upcoming wedding in June of next year. 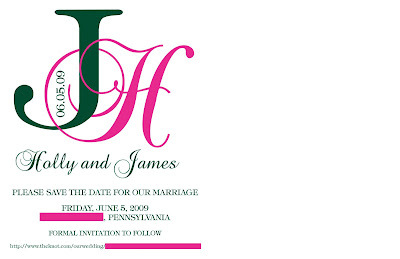 Holly contacted me earlier in the year to create some stunning monogram designs in her fun color palette of vibrant hot pink and rich emerald green tones and I loved creating those special touches for this couple's big day. 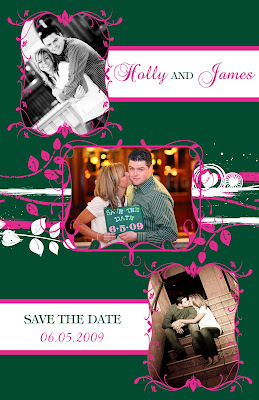 As you can only imagine, I was even more excited when Holly contacted me to create their save-the-date design. Holly wanted to include 3 fabulous engagement pictures that the couple had professionally taken (aren't they just the cutest couple?!?!?!) and other than that, she pretty much gave me creative control with the rest of the front of the card design and I definitely had a lot of fun with this project! Using lovely flourishing vine inspired graphics I framed each photo on the card and then accented with some funky coordinating accents across the middle of the card to complete the design. For the back of the card, Holly wanted to use one of her monograms as the main focus and then include the pertinent details for their upcoming wedding celebration to create a very simple and clean, yet very elegant look. Holly was completely ecsatic with the final results and I absolutely love the completed design as well. I cannot wait to hear the feedback from all of Holly and James' family and friends and hope that they all loved the save-the-date as much as Holly and James did! i've already recieved such great feedback, i can't thank you enough!! !